FILE - The logo of Google is pictured during the Viva Tech start-up and technology summit in Paris, France, May 25, 2018. 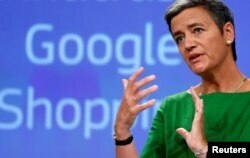 FILE - European Competition Commissioner Margrethe Vestager holds a news conference at the EU Commission's headquarters in Brussels, Belgium, June 27, 2017. The long-awaited decision comes as fears of a transatlantic trade war mount due to President Donald Trump's shock decision to impose tariffs on European steel and aluminum exports. Richard Yu, CEO of the Huawei Consumer Business Group, attends the launching of the new generation of its smartphone, Huawei P20, in Paris, March 27, 2018. Transatlantic tensions are also high after Trump berated NATO allies over defense spending at a summit last week, over his summit with Russian leader Vladimir Putin, and over the US president's pull-out from the Iran nuclear agreement and Paris climate deal.